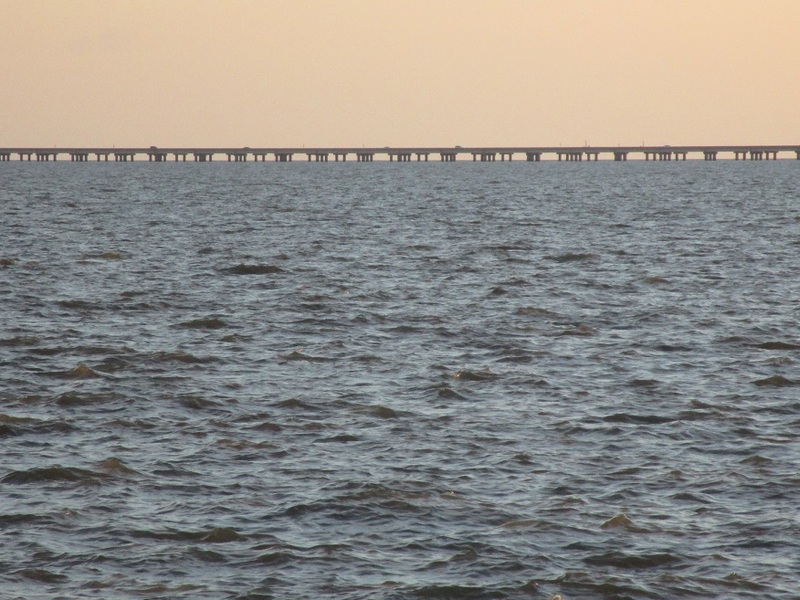 “No one ever hitchhikes across the Causeway.” The 24-mile Causeway Bridge stretches across Lake Pontchartrain from New Orleans north, to the towns of St. Tammany Parish (Mandeville, Covington). There is no mass transit across the bridge. As a worldwide hitchhiker (13 countries so far), I am accustomed to people saying that “no one hitchhikes here” or “you won’t get any rides here.” For the most part, they don’t mean to be discouraging. They are just trying to pass along useful information. So far, it has always been false. My sister dropped me off at the last gas station before the bridge and open water. I didn’t know what to expect but stuck out my sign – “Cov.” for Covington, with a yellow sun and a few sketchy suggestions of happy grass and flowers – and waited. It was a good spot where drivers could see me up close while pumping gas, but I wasn’t in their face obtrusively either. Five minutes and a working-class guy in his thirties said to throw my bag in the back of the truck and hop in. He grew up in New Orleans but now lives in an old Covington house that has been in his family for generations. He offered to take me all the way to Covington, to any location, but I hopped out in Mandeville to visit my aunt from Honduras and speak Spanish for a while. Although I’ve been in the area for a month, with lots of people on both sides of the lake, the flip (southbound) side of my sign – “New Orleans” with the same bright if infantile design – hasn’t been in use. 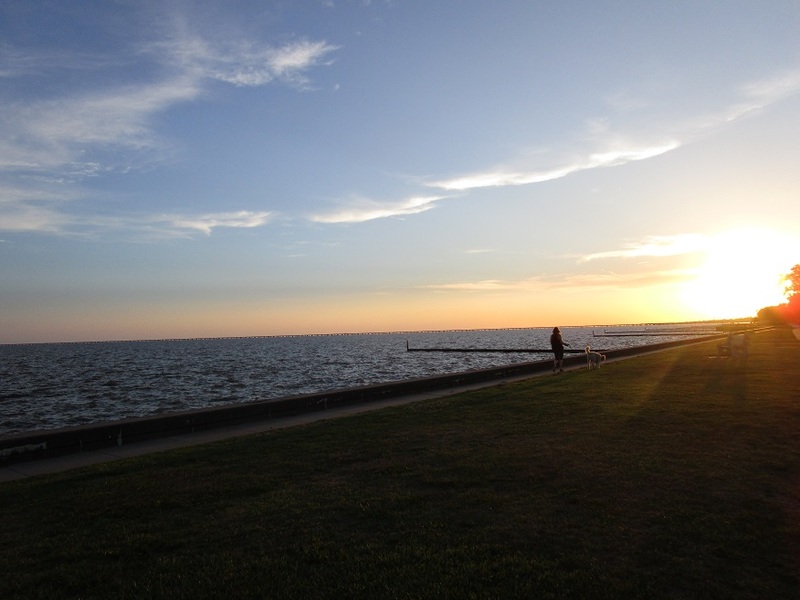 Once, on my way to New Orleans, I was dropped at a Café du Monde, but a southbound friend picked me up before I could start hitchhiking. This entry was posted in Uncategorized and tagged Hitchhiking, New Orleans, Travel by Daedalus Lex. Bookmark the permalink. You generally see those no hitchhiking signs near prisons! Hahaha. You’re right, JT. In this case, it was a quote of what someone said to me and not a sign. I hitched Manchester to Brighton, then down to Dover over to Calais to Strasbourg & into Germany, then from Germany (Mannheim) down to Bordeaux & the range of people was staggering. Not a single “cool” person in a VW picked us up, though plenty passed us. Very disappointing in the so called “hippie.” We got a lift from business men, no-nonsense old women, a Paleontologist, normal family people, with responsibilities & lots to lose if we were maniacs (we weren’t of course). I think they felt some parental instinct to see 2 young chaps trying to do something different whereas the “different” people in their VWs saw something else, a pretense or some such nonsense & thought, “why should we help?” There is a lot you learn about people hitchhiking. I heard it is illegal in America, is that true? Hi Daniel. Our routes and experiences are somewhat similar and somewhat different. The biggest similarity is the incredible range of people from different backgrounds and places who are willing to stop and help you out – especially good range of nationalities in that stretch through France and Germany. I’ve had more of a mixed bag on the hippyish looking characters. For sure, there are a lot of “style only” hippies in those VWs with no thought to the ideals. But I’ve caught a few genuine hippies recently (from Dresden into Poland and Munich toward Tübingen come to mind). Also a few of those older, no-nonsense types who in conversation reveal a crazy hippie past that preceded their “square” stage of life. Also a few of all ages who have no vestige of the 1960s hippie look but carry the hippie ideals in their hearts. And then, as you say, there’s just all the regular “non-hippies” willing to help strangers out. Hitchhiking is always one big chaotic affirmation for me 😊. Btw, it’s illegal on the US interstate system (as in Germany) but legal to stand on the ramps and smaller highways except where there is some odd local ordinance against it. In the sprawling distances of the US, I generally go straight to the illegal spots to catch long-distance traffic. In Germany, I play by the rules 😊.